I had an old unused photo from last time I applied for a visa or passport, and compared it to the requirements (decided not to use it because it was damaged). It seemed to match most of the requirements, except that it seems that they want a photo which isn't square: The required width is less than the required height. Assuming most drugstores are still providing square passport photos, the question becomes: Should I cut the photo to match the specified width? What adds to the confusion is if you look at the visa application form the box for the photo is nearly square, not the oblong shape in the requirements. And I have seen other advice that you need to make sure it fully fits the box. Any advice about what to do here? The photo size is 48mm (height) x 33mm (width). 小2寸 is the Chinese measurement unit used for a passport (link in Chinese). Also since January 2017 the requirement became more strict. Before that it is OK to have a smaller size (4x3) but it is rejected. I'm not sure if it is OK to have a bigger size, though. When I googled it is the Philippines that popped up first, but I'm sure it is consistent with other countries. 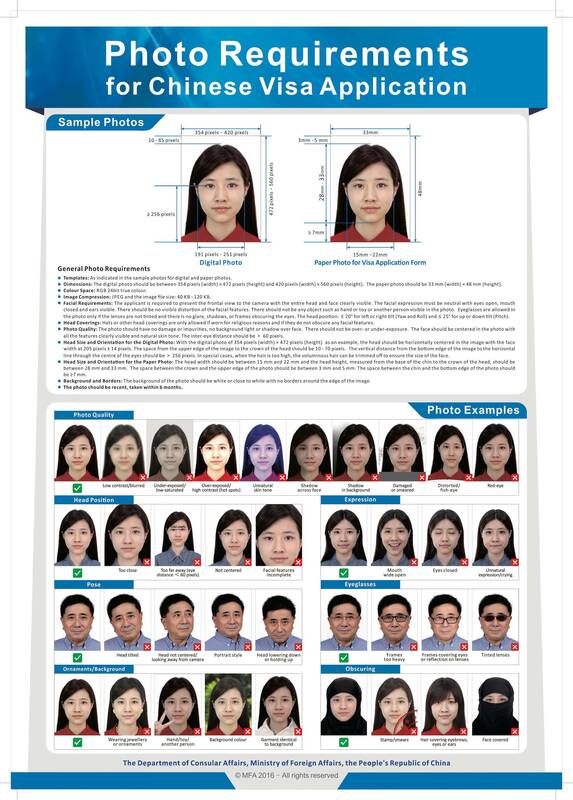 One more anecdote: I applied for a Chinese visa in Sydney using a standard Australian 45x35mm passport photo, several mm shorter and wider than the Chinese 48mm×33mm standard and with different requirements for height of head (32-36mm vs 28-33mm) etc, and it was accepted without a second glance. My husband just applied for a PRC visa from the Consulate General in San Francisco. Numerous people with typical "passport" photos were turned away, some after waiting for hours to be called to the drop-off window. Someone there also said they were not accepting manually cropped photos. Best to use a specialized photographer (like at a visa service, you can just buy the photo from them without having to pay for their messenger service). Not the answer you're looking for? Browse other questions tagged visas china applications or ask your own question. What is a good visa agent for obtaining a Chinese visa from the NY consulate? What are the current rules for converting Chinese currency to US?